Ayurveda is the Indian medical method that has the heritage of over 5000 years. Ayurveda has been gaining high popularity all over the world because of its holistic approach. Ayurveda which means the science of longevity has comprehensive solutions for all kinds of aliments and disorders. Ayurvedic treatments are very simple to follow and most of them are inexpensive as they are based on dietary solutions. Ayurveda also give importance to meditation and yoga which helps in maintaining proper energy balance in human body. It also has solutions to many critical ailments for which even modern medicine has no solutions for. This wonderful medical treatment method has solutions for all those who suffer from underweight conditions. There are ayurvedic medicines to help underweight people reach standard bodyweight. There are many good reasons for why you should choose ayurvedic medicine to gain weight. 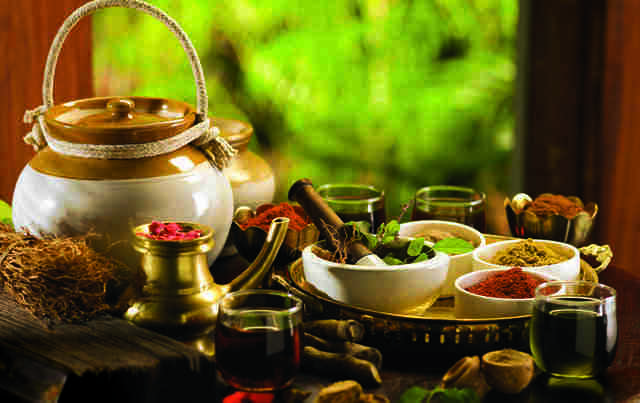 Ayurveda is one way of treatment that you can trust, as most of the ayurvedic medicines have no side effects. Also ayurvedic medicines are mild, inexpensive and easily available everywhere. Ayurvedic medicines do not have any harmful chemicals in it, and is very safe as they are derived from the Mother Nature. There are many well known ayurvedic medicines that help in gaining weight. Let us see some of them. Wonder what this is?!? Annonna Squamish is the scientific name for the very sweet seasonal fruit, custard apple. Custard apple is one of the best fruit that helps in gaining weight. for those who are reluctant about having ayurvedic medicines daily, custard apple is the way for you to go to achieve weight gain. Daily having one custard apple would help in achieving weight gain. Custard apple helps in gaining weight successfully by counteracting with anorexia and increasing the strength of body muscles. Ashwagandha is an herb which is also known as ‘Indian Ginseng’. This is a well known herb which helps in gaining weight. This herb is also used in many different medical preparations because of its high nutritional benefits. This herb which has multifaceted benefits is used to make an ayurvedic medicine known as ashwagandha churna. This medicine when consumed with a high calorie diet will help in gaining weight. This wonderful ayurvedic medicine is also available in all popular ayurvedic medicine stores. It is suggested to consume 100 mg of ashwagandha churna daily along with your high calorie diet to attain amazing results. There would be no one who hasn’t heard of this ayurvedic medicine. This is the most popular and well known ayurvedic medicine that helps in gaining weight. This tonic is made of a combination of different nutritious herbs from nature and provides a lot of benefit for the body along with gaining weight. Chyavanprash helps in strengthening the bones and muscles of the body. Regular intake of chyavanaprash will also help improving the immunity system of the body to a great extent. This medicine is suitable for people of all ages. Daily having two spoons of chyavanprash will help revitalizing your body by improving the blood circulation. It will also help in improving the digestion process and thus will make you feel hungry soon. This popular ayurvedic medicine which is available at all the major stores is a sure shot medicine for gaining weight. Saatavari is another popularly known herb used in many ayurvedic medicines. It is more popularly known to be helpful for women who are pregnant and for lactating mothers. Along with this, this herb is also helpful for those who are underweight as it helps in gaining weight. saatavari is also an excellent hydrator. It helps in maintaining the fluid balance inside the body. Saatavari is also helpful in improving the functioning of the digestive system. This herb is also available in all leading ayurvedic stores. They are available under major leading brands such as Himalaya herbals. This is another popular ayurvedic medicine which is available in both powder and tablet form. But unlike chyavanprash this is a prescription drug that should be taken only under medical guidance. Like other ayurvedic medicines Vasant Kusumakar Ras also provides a lot of benefits for the body. This medicine is a very good rejuvenator for the nerves and blood vessels. Along with this it also helps in increasing memory, improving skin complexion, increase immunity and help in gaining weight. Have vasant kumar ras daily in the morning in empty or full stomach. Ideal dosage of this medicine is around 125- 250 mg daily under the guidance of an ayurvedic practitioner. It is available under various popular brands such as Baidyanath, Dabur, and Shree Dhootapapeswar. This medicine can be administered together with sugar, ghee or honey. Weak immunity system is often the cause for underweight problems. People with weak immunity system are more prone to have an underweight body. They always find it difficult to increase the body weight. So for such people it is important to increase the body immunity first so that they can increase body weight. Yashtimadhu is one solution for those who are suffering from weak immunity. Yashtimadhu can help such people in increasing the body strength and stamina thereby increasing the immunity. These were a few common ayurvedic medicines that can help you gain weight and become healthy. Very low weight is a sign of weakness and low immunity. This can lead to fatigue, tiredness, anaemia, and even other issues. You need enough weight according to your height to live a strong and healthy life. Try out the above medicines and see the difference within a few days.